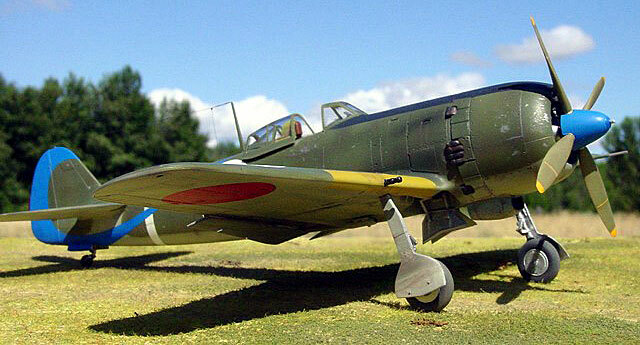 This is Hasegawa's 1/48 Ki-84 Hayate "Frank" built out of the box in the markings of an aircraft from the 29th Air Combat Regiment, Formosa, 1945. Decals are from AeroMaster's sheet 48-616 (Best Sellers: Imperial Hayates, Part II). 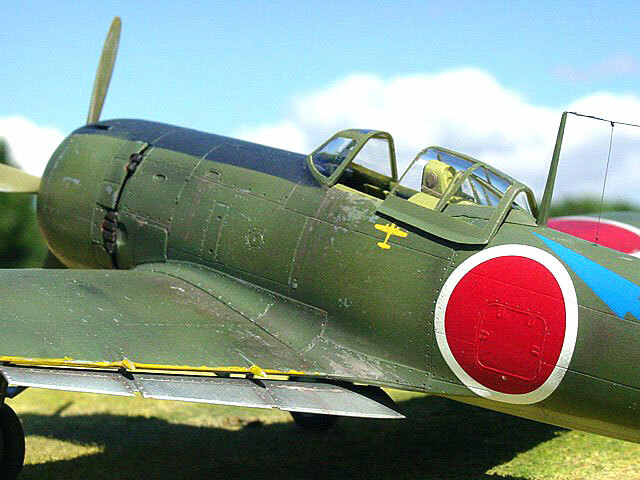 Hasegawa's Frank is a simple, well designed, and well detailed model that goes together without difficulty. Cockpit detail is very good and visible on the finished model. The seat comes with a reasonably represented pair of lap belts which I opted not to replace. Both weighted and unweighted tires are provided. This time I opted to build the kit as it was intended, despite the inaccuracy. It just looks better. Unless noted otherwise all painting was done using Polly Scale acrylics. The cockpit was painted Weyerhaeuser Green (a railway color which is a close match for Aeromaster's Nakajima interior green). Wheel wells, the inside surfaces of gear doors, and the inside surfaces of the flaps were painted with SnJ aluminum metallizer. The first step in painting the main body of the model was to apply a coat of Tamiya's gray surface primer from a spray can. I don't typically use surface primer; however, because I was applying yellow and white to the model I felt it would provide a better surface for their adhesion (yellow and white paints often have difficulty covering uniformly over bare plastic - light gray paint as an undercoat works wonders to remedy the problem). Yellow paint was sprayed over the leading edges of the wings. I opted to paint the leading edge bands rather than use the decals provided in the kit because I find the painted finish is easier to weather and looks more realistic. I used the kit's decals as a template for the masks that were used to cover the leading edge bands until all other painting was complete. A similar technique was used for the white fuselage band in front of the tail. 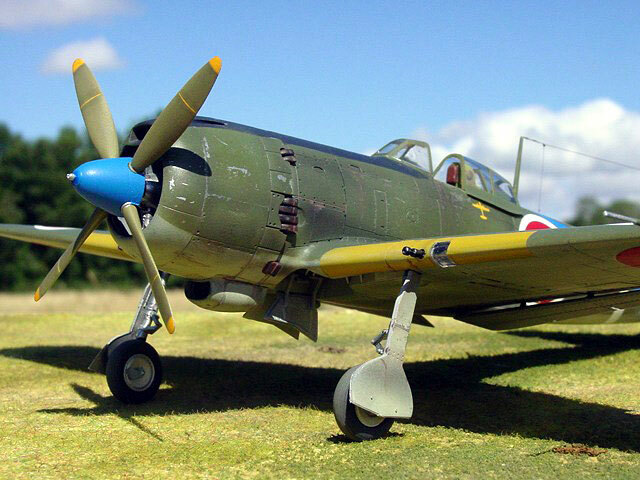 The exterior of the model was then sprayed with several light coats of SnJ aluminum metallizer, particularly on the front to mid fuselage and the upper wing surfaces (but not the ailerons - these were fabric). I did not buff the natural metal finish (NMF). If you do buff the NMF, the camouflage will not adhere well to the model. 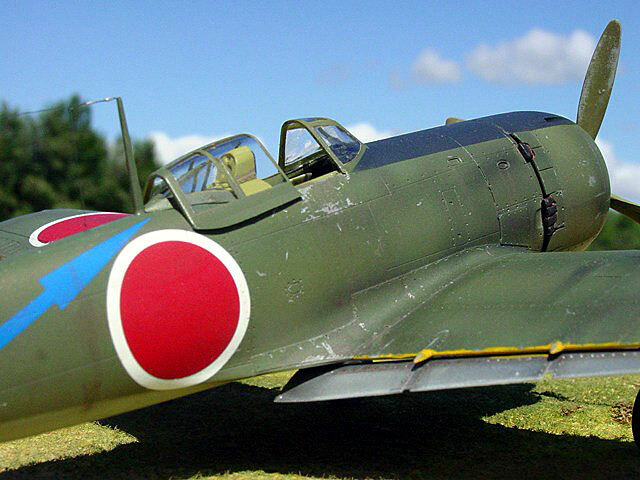 This shortcoming can be used to advantage if you want to create the effect of heavy paint chipping, as was often seen on many Japanese army aircraft late in the war. Once the NMF was added I pre-shaded the model with black. Pre-shading was applied to panel lines as well as to various panels chosen haphazardly over the model. Light post-shading (i.e., shading applied after application of the camouflage) with dilute black paint was applied on the upper surfaces to help break up the monotonous effect of the solid green camouflage. The undersurfaces were painted with Tamiya I.J.A. gray acrylic. For the upper surfaces I mixed 2 parts Polly Scale I.J.A. Green to 1 part Aeromaster Nakajima Army Green (Polly Scale and Aeromaster acrylics mix without difficulty). The upper cowl was painted flat black with a touch of light gray and dark blue for scale effect and fading. 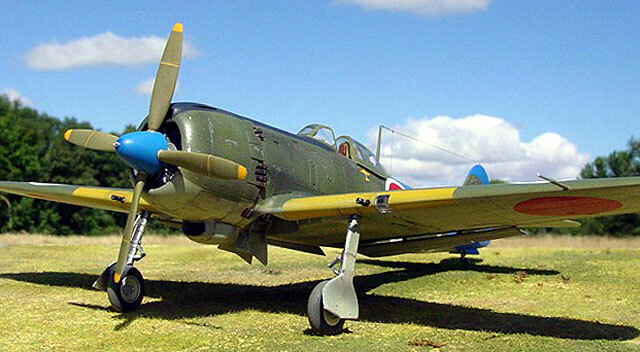 The propeller blades were painted a slightly lighter shade of green than was used for the upper camouflage. The spinner was painted French blue lightened with white - this mix made a superb match for the blue arrow decal on the tail. Testor's Metalizer sealer was added as a gloss coat prior to the application of decals. Microset and microsol were used to help settle the decals on the model. A coat of Polly Scale clear flat and clear satin (1:1 mixture) was sprayed over the model once the decals had dried. 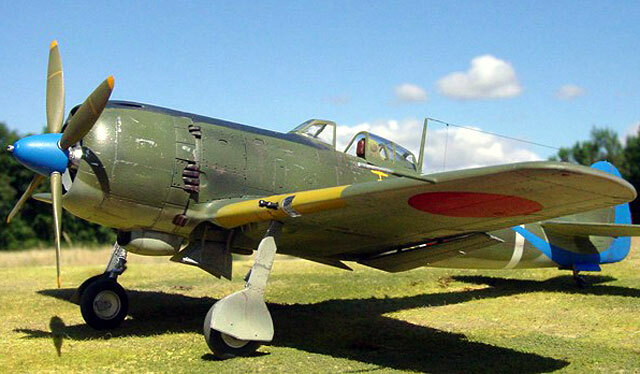 After painting but prior to the addition of decals, fine grain sandpaper was used to make surface abrasions and expose small amounts of the SnJ aluminum beneath, particularly on the cowl, wing roots and near the cockpit entrance. If too much aluminum was exposed, I repainted the green camouflage and started the process over. Washes of dilute raw umber and burnt sienna (Testors enamels) were applied to the wing roots beneath the cockpit to simulate boot scuffs. The wash was also applied to some of the panel lines, particularly on the underside of the model. Note that a soft brush was used to apply the wash to prevent the thinner from removing the acrylic paint beneath. Exhaust stains were simulated by spraying highly thinned black paint. All images were taken outdoors with a SONY S-75 digital camera set at its highest picture resolution (2048 x 1536 pixels). Other camera settings were as follows: 200 ISO film speed (it's an option - what can I say), 1000th/sec shutter speed, F-stop 8.0, and fixed focus distance of either 20 or 30 cm. Images were cleaned up using Adobe Photoshop 6.0 for the Macintosh. Specifically, the interface between the base and background were merged using the software's "blur" tool, and edges in some photographs were sharpened using the "sharpen edges" tool. Sharpening images in such a way helps to restore some of the clarity lost during image compression.